In challenge to SB78, ruling in 3rd District Court invokes Utah Constitution’s ban on partisan tests for ‘employment’ in the public school system. 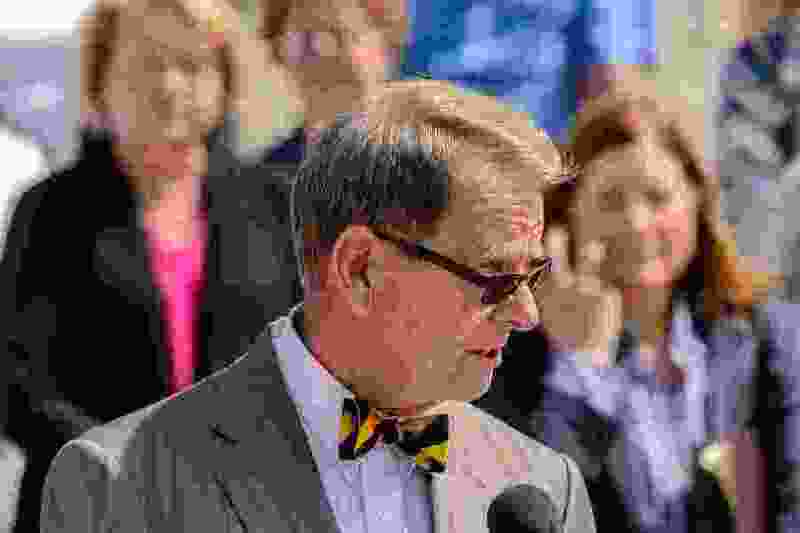 (Trent Nelson | Tribune file photo) Attorney David Irvine speaks at a news conference in Salt Lake City Tuesday June 27, 2017, announcing the filing of a lawsuit challenging the 2016 law establishing partisan elections for the Utah State Board of Education. On Monday, a judge ruled that the law, Senate Bill 78, violated provisions of the Utah Constitution. Elections for the Utah Board of Education are in legal limbo again after a judge ruled Monday that a planned shift to partisan campaigns next year violates the state’s constitution. Third District Court Judge Andrew Stone ruled in favor of a group of plaintiffs suing the state over Senate Bill 78, which passed in 2016 and created partisan elections for school board member beginning in 2018. The bill was passed following years of legislative stalemate after the state’s previous election system for school board members was struck down in court. David Irvine, an attorney for the plaintiffs, said he expects the state will appeal Stone’s decision. But if Monday’s ruling stands, he said, next year’s elections would follow the same format as 2016’s nonpartisan races. Prior to 2016, school board candidates were interviewed by a nominating committee that forwarded recommendations to Utah’s governor, who would then select the final two candidates to appear on the ballot for each board seat. That process was successfully challenged in court, leading to multiple attempts at election legislation on Capitol Hill before SB78 was approved by lawmakers last year. But in a court hearing last month, Irvine’s team argued that partisan elections violate the Utah Constitution due to language that prohibits the use of partisan tests for employment in public education. The state’s attorney in the case, Assistant Attorney General Thom Roberts, said no such test was created by SB78, since members of any political party and independent candidates are free to run and be elected. But in his ruling, Judge Stone wrote that the plain language of the state constitution suggests that school board elections are intended to operate independent of partisan politics. “There is perhaps no more partisan a test than a contested, partisan election,” Stone wrote. The judge also wrote that because school board members are paid a salary and are provided state-sponsored benefits, the plain meaning of “employment” would expand to include those individuals. The state’s interpretation of employment is too narrow, Stone wrote, and it is “unreasonable” to expect voters held that strict a definition of the word when they approved the constitutional language. Dan Burton, spokesman for the Utah Attorney General’s Office, said no decision has yet been made whether to accept or appeal the judge’s ruling.